On Tuesday, March 25, 2014 Eat. Drink. And Make a Difference. 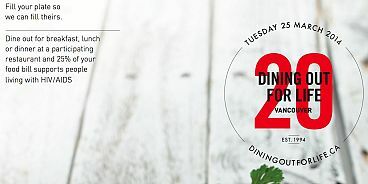 On that day, British Columbia’s largest hospitality fundraiser will see participating restaurants from Whistler to White Rock and across the Lower Mainland come together and donate 25% of their food sales in support of local men, women and children affected by HIV/AIDS. HIV/AIDS IN THE LOWER MAINLAND: In 2011, the Public Health Agency of Canada estimated 71,300 people living with HIV/AIDS in Canada — with over 25% residing in British Columbia. Vancouver’s Downtown Eastside maintains the highest HIV prevalence in the Western world, reaching as high 27%. While new infection rates in B.C. have thankfully decreased, advanced therapies mean people with HIV/AIDS are living longer and the number of people who depend on Friends For Life and A Loving Spoonful’s services continues to grow. On Tuesday, March 25, 2014, fill your plate and help us fill theirs.